When speaking to someone we don’t know very well, small talk is the key to a deeper conversation. Sometimes conversation doesn’t flow well and we feel talk blocked, but those who say they want to “cut the small talk” are not taking the time to understand what kind of deeper conversations would appeal to the other person. Your goal should be not to avoid small talk, but to pursue deep connections more effectively. 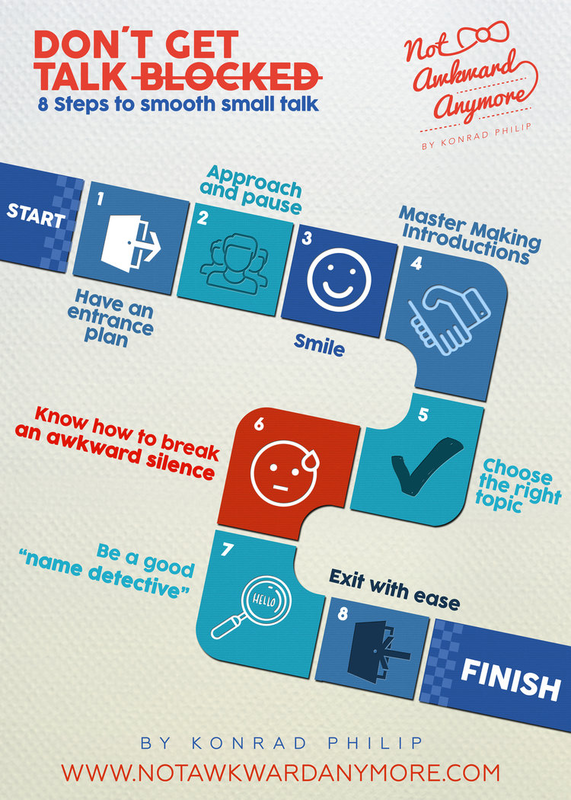 Stop idle chatter; get to the small talk finish line faster with these 8 tips! Yes, there is such thing as being fashionably late. If you are at a large event, you may not be greeted by anyone at the door. It is up to you to find someone to talk to. Everyone is watching the door, and after 15 minutes, even the most fascinating conversations could use a new participant. Step to the side of the entrance and pause, making yourself visible. Look for inviting eye contact or try to find people you would like to approach. At the risk of interrupting an intimate discussion, avoid breaking into groups of two unless invited. Everyone else is fair game. Look for a group with an open space, approach it, and pause. Soon enough you should be met with eye contact and perhaps even a greeting. That is an invitation to introduce yourself. Move on if you haven’t been acknowledged after 20 seconds. Being approachable and confident is key to successful small talk. Body language, and specifically your smile, can convey those qualities without a word. You only have seconds to make a first impression. Your introduction will take up most, if not all of that time, so it is important to do it right. When in a group, introduce yourself each person individually. Say your first and last name, and then never forget to repeat the other person’s name and add a conversation starter. That may be in the form of your job title, relation to the event host, or a brief compliment. If introducing people, you should always introduce a person of lower rank to one of higher rank (Mr. CEO, I introduce to you Mr. Manager. Mr. Manager, meet Mr. CEO), and introduce a group to a person (Jenny, I’d like you to meet our new colleagues Brian and Amy. Colleagues, meet Jenny), and new acquaintances to friends (Robert, meet my new friend Joe. Joe, this is Robert, we grew up on the same street). Whether introducing yourself or being introduced, practice the appropriate greeting. Depending on which part of the world you are in, this may be a handshake, a kiss, a bow, or even sticking out your tongue. If seated, rise for greetings. Find commonalities: The most common small talk starter is to talk about whatever brought you to the same place (mutual friend, club affiliation, etc). This is normally a safe subject and everyone has an answer to “what brought you here?”. Time travel: Dry small talk centers around the present. Today’s weather is a common example. Even a conversation about the weather can be made more exciting if you tell someone about that time you were caught in a storm, or about the sunny weather you are looking forward to on your next vacation. Asking basic questions about someone’s past or future can lead to interesting conversation. Ask for advice: Without incriminating yourself or others, talk about a problem or challenge you are facing. It may be you are looking for a more challenging hiking trail, or perhaps your car broke down and you need to find a good mechanic. Asking people for their advice or opinion makes them feel smart and useful. It is also good material for a follow-up contact. Start with a compliment: Offering congratulations for a recent accomplishment or repeating something impressive you heard about the person can be a good ice breaker. Limit comments on a stranger’s appearance; it might lead to a slap in the face, or worse, a superficial conversation! To keep things genuine, don’t immediately return the same compliment. Say “you”, don’t say “me”: Asking open-ended questions about everyone’s favorite topic (themselves) is a sure way to generate a lively conversation. This is especially useful for quiet people who would rather listen, and hungry people who would rather chew food. He who talks more is often not the better conversationalist. It goes without saying that hot-button topics can make new acquaintances uncomfortable, even if they agree with you, and should be avoided. It is not unusual for discourse to run its course. Not all silence has to be awkward. By maintaining your smile and not calling attention to your unease, you can still convey interest and friendliness. Eventually, of course, you want to break this silence with one of these phrases. So what you are saying is…. : Summarizing what the other person said shows you are curious and a good listener. This may prompt them to explain even further. Tell me more about…: Try to think of something that was said that you’d like clarified or further explained to you. Did I tell you…?/I forgot to tell you…: One positive about a lull in conversation is that it is your opportunity to completely change the topic of conversation. This conversation re-starter allows you to mention a fun fact, or a personal story that may have nothing to do with the subject you already exhausted. Did you hear…? : Prepare for small talk by getting up to date on current events and pop culture. General interest stories, or better yet, those relating to the other person’s passions, are your defense against an awkward silence. No matter how many times we do it, we will never feel comfortable forgetting a name. While is not rude to be upfront and apologetically ask someone for their name again, a good name detective knows how to recover one without confessing to the crime. “May I have your business card?” and “how do you spell your name?” are code for “I forgot your name”. Alternatively, you can re-introduce yourself in hopes the other will reciprocate (“Again, I’m Konrad Philip, it was nice to meet you”). The most sophisticated investigator will look for backup. Inviting another person into your conversation, when possible, will initiate another introduction, forcing everyone to repeat names. Think about setting expectations at the beginning of your conversation. If you only have 10 minutes to talk, say so upfront. At a gathering, it is not polite to leave anyone alone. If you want to exit a conversation, introduce a new person into the discussion first. If there’s nobody else around, tell the person where you are going (the buffet, the patio) and offer for him/her to follow. If by the end of this drill you haven’t made a new connection, do not consider it a waste of time. Because you are an effective small talker, you were able to recognize a lack of compatibility and exit the conversation smoothly, all in record time!